Who was Ernest Rutherford and what did he contribute to our understanding of matter and quantum mechanics? 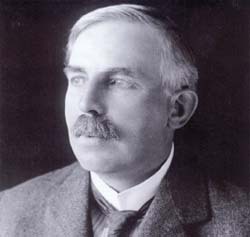 New Zealand physicist Ernest Rutherford (1871–1937) contributed greatly to the understanding of matter, especially its microscopic structure, and to the understanding of radioactivity. Rutherford is credited with creating the names “alpha,” “beta,” and “gamma” rays to describe different kinds of radioactive emissions. In his most famous experiment, he tried to figure out the structure of atoms by firing radioactive particles at a thin sheet of gold atoms. He expected the particles to be slightly deflected by the atoms; instead, to his surprise, very few particles were deflected at all, and some of them bounced right back as if they had hit a solid wall. Rutherford interpreted this result to mean that atoms consist of a large volume of emptiness, occupied by tiny negative charges, and a very small but very dense nucleus that contained a positive charge, Rutherford’s experimental result was the strongest evidence that matter is actually built of atoms.